I love food. I don’t know about you, but I’ve never met a bread I didn’t like. That’s why I am so excited about this new trend in food. Self Service! That means guests who love food as much as I do don’t have to be disappointed when they only get a tiny sliver of something they love and too much of something they don’t. Here are my top 10 favorite self service foods! 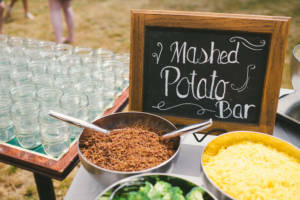 Show off your favorite variety of potato chip flavors in a stylized way. Make sure to set out lots of different dips as well! Serve them in small brown paper bags for some rustic charm. 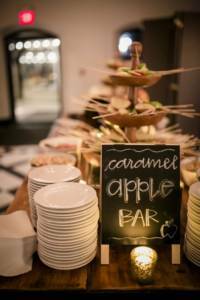 The simplest way to feed a lot of people is with what are called “Stations.” It’s basically a buffet but with each table being only one type of food. 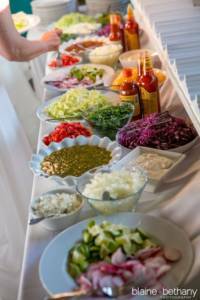 I love a taco bar because it’s easy to assemble for guests and allows for a ton of customization. 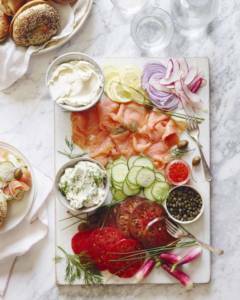 I love a bagel bar for a midday party like a bridal or baby shower brunch. 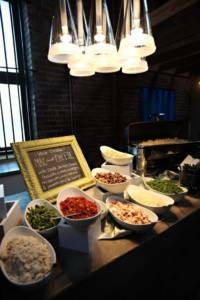 There are tons of topping options like smoked salmon, cured meats, cheeses, and fruits. You also get to be inventive with the cream cheeses. Serve them with mimosas and bellinis and you can’t go wrong. This is my favorite for the fall. Kids love adding all of the toppings and getting a little messy. Don’t want the little ones getting caramel and chocolate all over that beautiful white couch? Three words. Hand Washing Station. I always bring my portable one when I do self serve stations for kids. 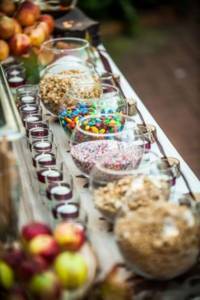 A candy bar at your reception is a totally sweet money saver and a cute surprise for your wedding guests! Pretty much everyone likes cupcakes especially when they are customized. Start with 4-5 different flavors of cupcakes. Then set out 4-5 different frostings and all of the toppings you can think of. Gummy worms, crushed Oreos, nuts (check for guest allergies first), sprinkles, M&Ms, shaved white, milk, and dark chocolate just to name a few. Set everything out in a stylized way and watch the funny combinations happen! I LOVE mashed potatoes. It’s the ultimate comfort food, and it’s so easy to make. Let guests add bacon bits, cheese, chives, sour cream, and salsa to their bowl of deliciousness! 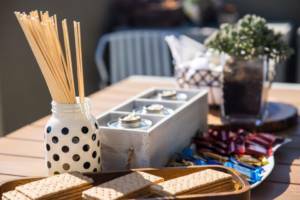 S’mores are super fun to make and they never fail to bring the kid out of all of us. 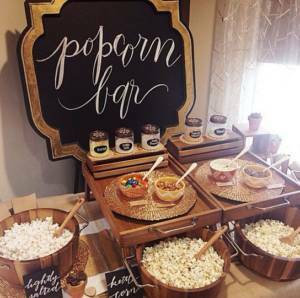 Take your s’mores to the next level with gourmet chocolates and artisan marshmallows. Oh mac & cheese. You and your creamy goodness can be at any party and make a statement. Bacon, sauteed veggies, more cheese, and fresh herbs. You really can’t go wrong here.